Firefox and Chrome are among the leading browsers in terms of both popularity and their ease of use. Though Firefox provides us with the best browsing experience, it irritates us with its frequent crashes. This becomes annoying especially when you are about to do something particularly important on the web, say making bank transactions. You wouldn’t ever want the browser to cheat you at critical times. So, here we will dig on a few methods to kick off the crashes. I will recommend you to keep the browser updated at all times as an initial step.This might be a small prevention from crashes and also provide you with the updated features. I will discuss here the different methods to overcome the crashes. Whenever firefox crashes, you will see a dialog box popping up. There, you will find options to inform the Firefox about the crash so that they can look into it. This is done by choosing Tell Mozilla about the crash so they can fix it below which you can find details about it.The details will let the firefox know why the crash would have occured in your system, say, for example the page you were currently browsing. 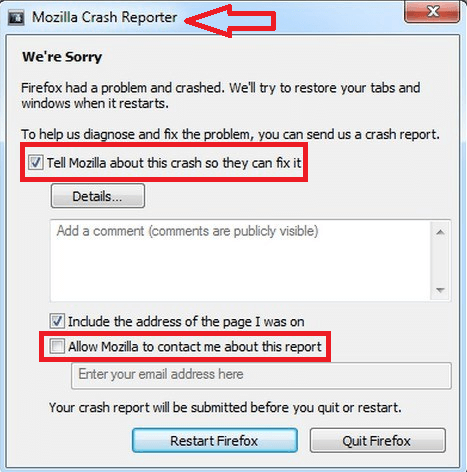 Alternately,if you want the Firefox to contact you about the crash and provide you ways to fix it up, you can choose the option Allow Mozilla to contact me about this report. They will contact you based on your IP address., hopefully. 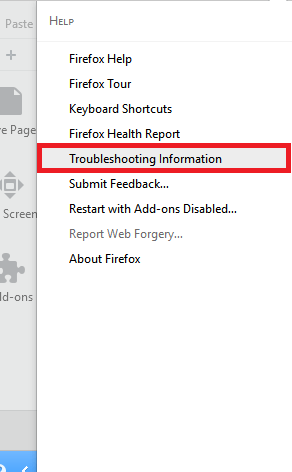 If you choose the Restart Firefox below the dialog box and the crash occurs again, there are chances that the windows or tabs you are currently browsing had caused the crash. Try to start out with a new Session to come over it. If an extension,hardware acceleration or the theme is the culprit, then switching the firefox to a safe mode can be a better option. To accomplish this, follow the below given steps. Select Restart with add-ons disabled from the menu emerging out. Select Start in the safe mode in the window that pops up. This method can be useful in case you need to get rid of problem causing site preferences,extensions, themes or search engines. All the information about your browsing is stored in a profile, which might cause crashes if they are subjected to any viruses. 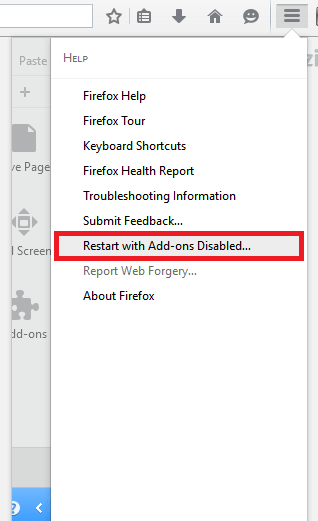 Resetting firefox may help creating a new profile. But you needn’t worry. The whole of your history, cookies, auto gills and saved passwords will exist same as before. 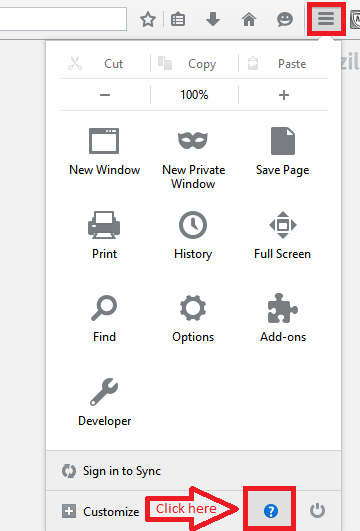 Go to Firefox menu on the right. Select Troubleshooting Information from its menu. From now on, any time your browser crashes, follow any of the above methods to overcome it.Hope you found this article useful.